Between two hoardings, where they are building new shopping centres, steps cut into the earth take you down to the bus terminus. Out of sight of police and local officials, sellers on the sly offer clothing, leather goods, DVDs ... Beggars of all kinds have also found refuge in this obligatory passage for crowds of travellers. Does this infinite adaptability bring out the african background from behind the civilized and futuristic exterior of Rwanda "Vision 2020"? "People are not very stable, they are hungry for teaching about the Bible and prayer. In Uganda and Kenya they are ahead of us in prayer!" says pastor Eugène from Kibagabaga Anglican Church. "What can you do if you don’t know how to read? ", a girl reacts when they distribute the leaflet with the themes and questions for reflection and sharing. 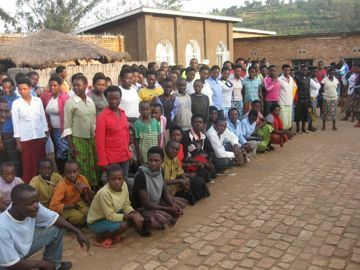 Kanzi was the second parish established in the diocese of Butare and the ninth in Rwanda. It’s more than a century old. There are five schools within its boundaries. 80% of the population is Catholic. "But young people are difficult. Some do not want to finish high school. Parents do not dare ask them to work in the fields. They do not even have the initiative to raise a chicken or rabbit to start something for themselves! ", explains Father Eric. Friday 15 June : Commemoration of those who worked for the diocesan administration, victims of the genocide. A purple banner leads the way, the staff follow, singing, to the Cathedral for a memorial service. "We can not play the drum and show you our traditional dances as we had wanted to. It would disturb the celebration next door," the leader of the group explains. Along the way back to Kigali, groups gather at memorial sites where victims are buried. Tents have been erected, there are official speeches or testimonies and visits to the graves. Throughout the months of April, May and June, commemorative ceremonies succeed each other around the country. We arrive at the parish of Kirehe, where he is the pastor, one hour late. Again everything is set up to welcome a conference speaker: table on the podium, youth young people sat on benches in rows. "We are ready to receive your message or whatever you want to tell us." Difficult to say that I would rather ask the young people questions and listen to their experiences. "How much time do we have?" "Take all you want!" In fact we have to let the young people go after an hour. They are happy to tell in a few minutes about the most significant events of recent weeks for them. One after another they rise and share a little of what they live: Said, a Muslim, explains how students are leading campaigns for solidarity: "For the victims of the earthquake in Haiti, everyone was invited to give 50 Rwandan Francs, for those of the drought in Somalia we sent some beans." Parish and diocesan forums are milestones marking many young peoples’ paths. Gaston leads a choir. Gentil is a teacher at the school next door. Young teachers run clubs for pupils: unity and reconciliation, fighting against AIDS, fighting against genocidal ideologies, preserving the environment. Fulgence takes part in a group that is committed to reconciliation. "We pray that people are free from hatred. We try to live a brotherly love." Sunday, 24 June : To avoid being late for Mass at 7am in Kamonyi we must leave home at half past five. 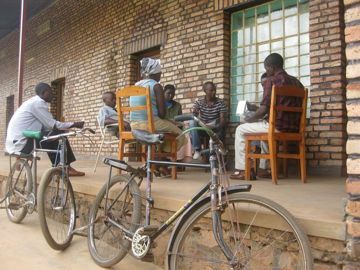 Viateur, the youth coordinator of the Diocese of Kabgayi, joins us and explains our project to eagerly listening parishioners. The elderly are rare in Rwanda, even in churches, and meet their eyes when they receive communion is impressive. Two hours of meeting with the young people while the second mass fills the main church once more. 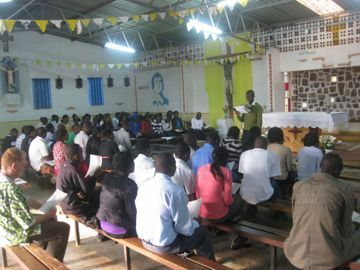 Wednesday, 27 June: Board meeting of the Youth Ministry at Kabgayi. This is an opportunity to thank the chaplains and their colleagues for the welcome they have given us during "raids" in their parishes and to join in their concerning a "strategy" for young people. "During our visits we were touched by the availability, good will and enthusiasm. A beautiful pastoral field opens up before you. In the context of the profound changes that are affecting society and ways of life, God can bring forth new branches on the great tree of faith in Rwanda.